Greyhound racing in Florida could come to an end if voters approved Amendment 13 on the November ballot. A proposed constitutional amendment intended to end dog racing in Florida was thrown off the November ballot by a Tallahassee judge Wednesday, and by Thursday Attorney General Pam Bondi had appealed the ruling to the Florida Supreme Court. Proposed Amendment 13, placed on the ballot by the Constitution Revision Commission, "is clearly and conclusively defective" because it misleads voters, concluded Leon County Circuit Court Judge Karen Gievers. The appeal puts a stay on Gievers' ruling until the court can review it. The deadline for finalizing the state ballot is Sept. 9, with overseas ballots distributed on Sept. 22. 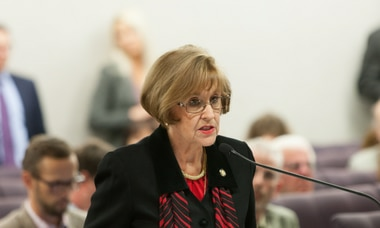 Gieveres called it a “material omission” that the summary and title of the amendment omits that fact that the amendment will decouple dog racing from slot machines and fails to explain that by adopting the amendment voters are embracing “a new ‘fundamental value’ of humane treatment of animals” in the Florida Constitution. The proposal "is misleading and inaccurate and incomplete, while adding up to a 'hide the ball,' fly a false flag' and outright 'trickeration,' she wrote. The amendment was challenged by the Florida Greyhound Association, the owners, breeders, and trainers whose livelihood could be jeopardized if the proposal were to be approved by voters. Gievers agreed with the association that the amendment fails the constitutional test of clearly providing voters accurate and complete information about the impact of the amendment. "Contrary to the words presented for consideration by the voters, the amendment would not end dog racing, nor would it eliminate wagering on dog racing,'' Gievers wrote. Lawyers for the Greyhound Association argued that because tracks would still be allowed to conduct betting on dog races that are broadcast from outside the state, it would not put an end to all greyhound racing. Greyhound racing has been dying in popularity for the past two decades but has been sustained in Florida because legislators required that in order to obtain a slot machine or card room permit, the operators had to perform a fixed number of live races a year. Under the proposal, Florida would ban commercial dog racing after Dec. 31, 2020, shutting down the industry's largest U.S. venue. The amendment was backed by animal rights groups and had the support of the Animal Law Section of the Florida Bar. The supporter's political arm, the Protect Dogs-Yes on 13 campaign, said it would appeal the ruling. "This is the first step on a long road, and we are confident that the Florida Supreme Court will uphold the amendment,'' the group said in a statement. "This lawsuit is a desperate attempt to prevent voters from having a voice on whether greyhound confinement and deaths should continue." The group, which has the support of animal welfare organizations, greyhound adoption groups and many civic organizations, argues that greyhound deaths are a constant at a Florida racetracks. "Greyhounds also endure lives of confinement, kept in warehouse-style kennels in rows of stacked metal cages for 20 to 23 hours per day,'' the statement said. "Amendment 13 will phase out this cruelty, and help thousands of dogs." The ruling could be a warning to the CRC, which faces legal challenges on two other amendments in which opponents claim they are misleading. Proposed Amendment 10 is being challenged by Miami-Dade, Broward and Volusia counties because it fails to explain that it would strip voters in those counties of their constitutional right to govern themselves by overriding their home rule charters. The amendment rolls together several ideas, the most controversial of which would require Broward to elect a tax collector, Miami-Dade to elect a sheriff to replace its appointed chief law enforcement officer, and force Volusia County to reverse a decision voters made in 1970 to appoint its county officers. A hearing in that case is set for Friday in Leon County Circuit Court.